When I was sent some samples from the UK’s leading fairtrade soap and body care company Visionary Soap to review, I knew as soon as I opened the package I had discovered something exciting and luxurious. The rich, aromatic fragrance that exuded as I opened the parcel was a delight and a sure sign of quality. Visionary Soap are dedicated to producing high quality fair trade products, sourcing fair trade ingredients from across the globe and in turn creating manufacturing projects in countries such as South Africa to help aid unemployment. Their products are then sold in a variety of outlets in the UK with an ever increasing international presence having stockists around the world. More information can be found on their website http://www.visionarysoap.co.uk or Facebook & Twitter pages. 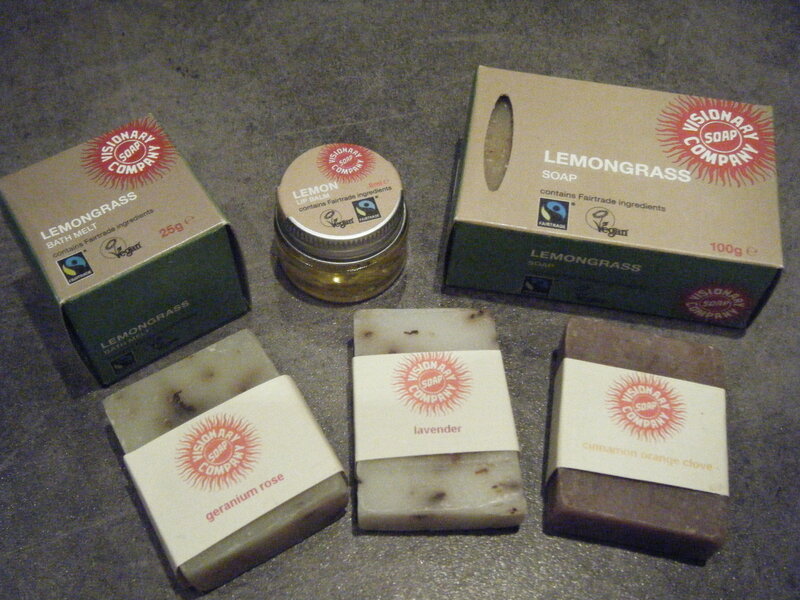 I was sent a selection of their Organic soaps to try and immediately loved the natural, rustic look to them. They smelt divine and I couldn’t wait to try them. I used a different one each day to allow me to appreciate the scent associated with each soap. I loved the lather that each one produced, rich and smooth, leaving hands feeling silky soft. I particularly enjoyed using the Lemongrass soap, very fresh and deliciously lemony, perfect for a morning wash or a cleansing of hands. The Lavender, a scent which I can often find overpowering, was subtle but gently fragrant and the Geranium Rose was just gorgeous – a rich rose scented soap that oozed fragrance – an absolute pleasure to use and one I know my mum (a huge rose fan) would be delighted with. As well as Organic soaps, there are a number of other Organic products available from Visionary Soap, namely Bath and Body Oils, Lip Balms, Shea Butter bath melts and Body Butters. I was fortunate to receive an Organic Lemon Lip Balm to try, which for me being, a total lip balm addict was perfect. I would be lost without some form of lip balm being within my reach 24/7. I have one in my handbag, by my bedside, on my laptop, in Mister B’s changing bag, in my drawer at work – you get my drift – so to try a new one – I was in heaven. With lemon being a flavour I am particularly partial to, the Organic Lemon Lip Balm from Visionary Soap was an outstanding success. It has a very silky texture that just glides across the lips. I have to say that overall I am very impressed by Visionary Soaps fair trade products and I feel that the prices are very reasonable and highly competitive. On top of this they are currently running a special offer on in January for a FREE Bag of Assorted Soap Varieties on all orders which can be combined with promotional code VSC2012 for an additional 10% off! So what are you waiting for – don’t just take my word for it – try them for yourself, you will not be disappointed!! This entry was posted in Beauty Reviews, Reviews and tagged review by Fiona Martin. Bookmark the permalink. I have bought from this company before and I agree with you – they are fab! Great for gift ideas too!